Champagne Mystery — Who makes Drake’s Mod Sélection? And will it be worth it? Ace of Spades, part II? Canadian rapper Drake and Brent Hocking (founder of DeLeón Tequila) are partnering to produce a new high-end Champagne called Mod Sélection. Right off the bat, the line-up will feature a $300 non-vintage Brut and a $400 NV Rosé. That’s a hefty price tag for a Champagne house that is being created virtually out of thin air. 1996 Bollinger R.D. (Wine Searcher Average $328) aged ten years on the lees. Only 750 cases imported. 1996 Duval-Leroy Femme de Champagne (WS Ave $346) from 100% Grand Cru fruit that was aged 14 years on the lees. Only 1000 cases made. Dom Perignon “P2” Brut, 2000 (WS Ave $351) aged 15 years on the lees. Jacques Selosse Substance Blanc de Blancs Grand Cru Brut (WS Ave $312) from a solera that started in 1986. Usually only around 250 cases released at a time. Pierre Peters L’Etonnant Monsieur Victor (WS Ave $301) from 100% Grand Cru fruit, including the best parcels of Les Chétillons, aged as a perpetual cuvee (similar to solera) that started in 1988. Only around 150 cases imported with each release. And tons more great Champagnes for a heck of a lot cheaper. Plus, these are all houses with established track records. We can figure out the grape source and know how long these wines have been aged. We can also get a general sense of how limited and prestigious these wines truly are. Yet, Drake and Hocking want folks to pay an equivalent price for Champagnes that no-one knows anything about? Even Ace of Spades had a bit of a backstory. From $60 to $300, not a bad business deal for Cattier. Offended by comments by the CEO of his-then favorite Champagne house, Roederer, the American rapper Jay Z began promoting a brand called Armand de Brignac in 2006. The gold plated bottle, now known as “Ace of Spades”, was made by the Champagne house Cattier. The Champagne was essentially a rebranding of their Antique Gold line which previously sold for around $60. But once Jay Z got involved, including acquiring partial ownership of the brand in 2014, the price of the Champagne skyrocketed to around $300 for the basic non-vintage brut, $450 for the NV Rosé and approximately $600 for the NV Blanc de Blancs. Yeah, you can see why Drake would want to follow suit. But, again, consumers at least know about Cattier’s involvement. The brand is even prominently featured on their website. Even though they’re a négociant-firm that purchases grapes, the Cattier family does own over 30 ha (74 acres) of vines in the Montagne de Reims including the notable premier cru Clos du Moulin in Chigny-Les-Roses. For their top cuvee from the Clos, the house only produces around 25,000 bottles. In the Christie’s World Encyclopedia of Champagne & Sparkling Wine, Tom Stevenson & Master of Wine Essi Avellan offer some more details about Armand de Brignac (presumably provided by Cattier). They note that across all the Ace of Spades wines, only around 3200 cases are produced. 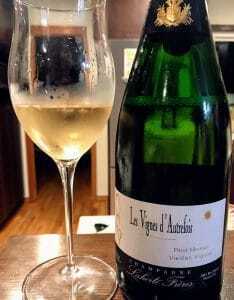 They also mention that at least the NV Brut is aged for around four years on lees. Perhaps more details about Mod Sélection will eventually come out. But it is clear right now that its proprietors are purely marketing it based on its association with a celebrity rapper. Still, I’m always down for a good mystery (especially when Champagne is involved), so I decided to see what I could dig up. Like with Armand de Brignac/Ace of Spades and Cattier, Drake and Hocking are probably partnering with an already established Champagne house. They’re not going to buy vineyards, start aging stock and truly create a brand from scratch. With a NV Champagne needing a legal minimum of 15 months aging on the lees before release, it’s very likely that the initial release of Mod Sélection is going to be a Champagne that was originally harvested and aged to be labeled as something else. Probably a Champagne that was going to be sold for a much lower price. That is a big reason why the identity of the house will likely be kept under wraps. But can we still figure out who makes Drake’s Champagne? On the Mod Sélection website, details are scarce. However, we do get two solid clues that slip through the marketing flourish. 1.) They’re based in the Vallée de la Marne. 2.) They claim “a legacy” dating back to 1892. Cracking into some of my Five Essential Books On Champagne, I can eliminate a lot of prospective houses. The Christie’s Encyclopedia is, in particular, really good at noting the location of many houses so I can focus in only on the ones based in the Vallée de la Marne. Vineyards in the Grand Cru village of Aÿ–the most prestigious in the Vallée de la Marne. This area is broken into three sub-regions. The most prestigious is the Grande Vallée de la Marne which is home to the Grand Cru village of Aÿ as well as several notable premier cru villages like Hautvillers, Cumières and Dizy. The other two sub-regions are the Vallée de la Marne Rive Droite and Vallée de la Marne Rive Gauche (Right bank, Left Bank) which are home to autre cru villages that are ranked below premier cru. Peter Liem’s book, Champagne, does an excellent job of explaining the differences between these sub-regions. While it is possible that Mod Sélection’s mystery house is in one of the lesser Rive Droite or Rive Gauche villages, I’m going to give them the benefit of the doubt and focus on the houses in the nine villages of the Grande Vallée de la Marne. Bollinger wouldn’t even give James Bond his own made up Champagne house. It’s not likely that they would partner with Drake and not use their own label. We can rule out major Champagne houses based in the Vallée de la Marne like Deutz, Jacquesson, Bollinger, Philipponnat and Billecart-Salmon because they have little reason to create a branding apart from their own. Plus, their founding dates don’t match up with Deutz (1838), Jacquesson (1798), Bollinger (1829), Philipponnat (1910) and Billecart (1818). But eventually, with a little bit of online sleuthing, I was able to come across at least one estate that fits our bill. Vineyards in the premier cru village of Cumières in the Grande Vallée de la Marne. Is this the home of Drake’s $300+ Champagne? Champagne Philippe Martin in Cumières. Founded 1892. They produce around 12,000 to 80,000 bottles which range in price from 18 to 34 euros ($20-39 US dollars). While they apparently have a healthy enotourism operation, as far as I can tell, the wines of Champagne Philippe Martin have never been exported out of France. This kinda aligns with the Mod Sélection description of partnering with a house whose “highly sought-after champagne had never been exported for sale to the general public.” Though you have to eye roll at the “highly sought-after” part. Is this our mystery Mod Sélection house? Perhaps. There are still at least 30 other small growers that I need to investigate. But so far Champagne Philippe Martin is our most solid lead. Will the Champagne be worth $300+? Tagged A.R. Lenoble, Ace of Spades, Alexandre Cattier, Armand de Brignac, Aÿ, Bereche & Fils, Billecart-Salmon, Bollinger, Brent Hocking, Cattier, Champagne [Boxed Book & Map Set]: The Essential Guide to the Wines, Champagne Philippe Martin, Christie's World Encyclopedia of Champagne and Sparkling Wine, Cumières, Deutz, Dizy, Dom Perignon, Drake, Duval-Leroy, Essi Avellan, Gaston Chiquet, Gatinois, Georges Laval, Gonet-Medeville, Hautvillers, Jacques Selosse, Jacquesson, Jay Z, Jean-Jacques Cattier, Laherte Frères, Les Chêtillons, Marc Hebrart, Mod Sélection, Mousse Fils, Peter Liem, Philipponnat, Pierre-Peters, R. Pouillon & Fils, Roederer, Tarlant, Tom Stevenson, Vallée de la Marne. Today is the beginning of the 2018 Hospice de Beaune weekend. It’s also the worldwide release day for the documentary film Three Days of Glory. I got a chance to get a sneak preview of the film that was produced and directed by Scott Wright of Caveau Selections and filmmaker David Baker. As I’ll explain below, it’s a must watch for wine students and Burgundy lovers. But first, a teaser from the trailer. This is a central theme of the film. It follows the journey of several Burgundian producers, including Thiébault Huber of Domaine Huber-Verdereau in Volnay, Patrick Essa of Domaine Buisson-Charles in Meursault and Thierry Violot-Guillemard in Pommard, as they deal with the devastating April frost and numerous curve balls that the 2016 vintage threw at vignerons. 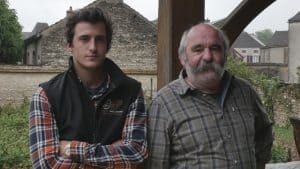 While grappling with the complications of the present, the vignerons (along with other voices like Burgundy expert Allen Meadows of Burghound and Scott Wright himself) contemplate their place in the traditions of Burgundy as well as the role they play in shaping the future of their families’ domaines. Thierry Violot-Guillemard and his son, Joannès. Media photo courtesy of Scott Wright/David Baker. What is exceptional about Three Days of Glory is that it really highlights what Wright calls “the human element” of Burgundy’s story. Every wine book you pick up about Burgundy will spend gallons of ink in exposition of terroir. That is irrefutably a huge part of Burgundy. But the hands that put Burgundy’s story to paper, that shepherd the fruits of terroir to the glass, are the hands of the men and women who work the land. Their heartbreaks, their struggles and, indeed, their glories are intimately connected. Against the backdrop of this troublesome vintage, Wright and Baker give viewers a chance to learn about what makes Burgundy, Burgundy in ways that you can’t gleam from a book or bottle. Coupled with the film’s beautiful cinematography, watching Three Days of Glory is the next best thing to visiting Burgundy itself when it comes to understanding the region and its wines. While the film is playing in selected theaters, you can rent Three Days of Glory at home on iTunes for only $4.99. That’s well worth it for a date night with a nice bottle curled up on the couch. 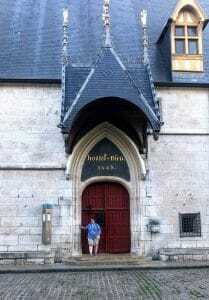 The closest that I’ll ever get to the Hospice de Beaune. The title of the film refers to the Les Trois Glorieuses, the 3 day celebration around Hospice de Beaune weekend that happens every November. Regardless of the success or struggles of the year’s vintage, the Burgundians celebrate the end of harvest with events such as the famous Confrérie des Chevaliers du Tastevin dinner at Clos de Vougeot, the La Paulée de Meursault luncheon and the Hospice de Beaune wine auction conducted by Christie’s. While you have to be a Burgundy insider to attend most any of these events, if you have deep pockets, you can visit Christie’s website on Sunday to make a bid. The time listed is 2:30 pm. I’m not sure if that’s London or Beaune time so I would recommend folks on the West Coast US to set their alarm for 5 am if they want to be part of the action. Or, like me, you can live vicariously through Three Days of Glory as they showcase the auction and festivities around the weekend. It’s near impossible to watch Three Days of Glory without wanting to try the wines of the producers featured. So right after you finish, you can do what I did and head over to the Caveau Selections site. There you’ll find a little bit of back story about Scott Wright and his wife, Martha, who started their import firm in 2005. Prior to getting into the import business, the Wrights founded Scott Paul Winery in the Willamette Valley. Scott also worked several years with the Drouhin family as director of Domaine Drouhin Oregon. I know this is a post about Burgundy but this old vine Pinot Meunier from Laherte Frères is seriously one of the best wines that I’ve had all year. I was so excited to see that I could get this from Caveau Selections. Not only do they have available wines from many of the domaines featured in the film (including from the 2016 vintage), they also have an awesome selection of Grower Champagne. I particularly flipped when I saw Laherte Frères (an insanely good Pinot Meunier specialist) and Pertois-Moriset (great blanc de blanc grower from Le Mesnil-sur-Oger). I haven’t decided if I want to join their curated wine clubs yet but it’s clear that the Wrights have a passion for seeking out exceptional growers to feature. While I greatly enjoyed watching Three Days of Glory, I think the discovery of the portfolio of Caveau Selections is going to be delighting me for years to come. Tagged Allen Meadows, Burgundy vintages, Caveau Selections, Confrérie des Chevaliers du Tastevin, David Baker, Domaine Buisson-Charles, Domaine Huber-Verdereau, Hospice de Beaune, Laherte Frères, Patrick Essa, Pertois-Moriset, Scott Wright, Thiébault Huber, Thierry Violot-Guillemard, Three Days of Glory, wine auction. Here is what I’m reading today in the world of wine. Pinot Meunier Goes Beyond the Blend in Champagne by Jameson Fink (@jamesonfink) for Wine Enthusiast (@WineEnthusiast). Brought to my dash via Frank Morgan (@DrinkWhatULike). A few of my favorite Pinot Meunier-dominant Champagnes include Billecart-Salmon Brut Reserve NV and Duval-Leroy NV Brut with the grape often playing equal billing with Pinot noir in the wines of Pol Roger and for Charles Heidsieck’s Brut Reserve. But what excites me the most about Fink’s article is the emergence of single varietal Pinot Meunier Champagnes with Fink’s providing a nifty shopping list of producers to seek out. Several of these growers (such as Jérôme Prévost and Laherte Frères) have been on my must-try list since I reviewed Robert Walters’ Bursting Bubbles and this just gives me more incentive to hunt them down. Here We Go Again: Value Bordeaux 2015 by Neal Martin (@nealmartin) of Vinous (@VinousMedia). The 2015 and 2016 vintages are going to be a smorgasbord of goodness for Bordeaux lovers. While, yes, there are going to be the outrageously priced top estates, there is also going to be an abundance of value. In this article, Martin list several top finds under $25 that are very intriguing. I’ve had Château Paloumey from the less than stellar 2011 vintage and was rather impressed so I would be very interested in trying the 2015 of this Haut-Medoc estate. Another wine that Martin highlights is the 2015 Eva from Château Le Pey that is 25% Petit Verdot! The concept of Second Wines is well known for Bordeaux lovers. It allows an estate to be more selective in both the vineyard and winery, limiting their top cuvee to just the “best of the best”. The remaining juice is still very good but often doesn’t merit being premium priced so estates would create a second label to sell the juice. The benefit to the consumer is that they get the pedigree of the Grand Vin’s viticulture and winemaking teams but are only paying a fraction of the price of the top cuvee. In California, the wineries are also very selective in limiting their top cuvee to just the “best of the best” but would instead sell off the declassified juice as anonymous bulk wine to other producers. California négociants like Courtney Benham often make off like bandits buying premium lots from top wineries and selling them under their own label. But the consumers still don’t know where the juice came from which is why I’m encouraged by Berger’s article that more wineries are starting to create their own second labels to bottle their declassified lots. I’m particularly intrigued by Cathy Corison’s Corazón and Helio labels and Ramey’s Sidebar wines. I really wish this was an April Fool’s Day joke but I fret that it is not. So consider this a public service warning because soon your local grocery stores and gas stations are going to be inundated with displays and marketing for Apothic Brew— a “cold brew-wine” hybrid created by Gallo. While I was able to find some redeeming factors in the whiskey barrel aged wine trend that Apothic helped popularize, I really have no clue what Gallo’s marketing team is thinking with this. But, it’s Gallo and they didn’t become a billion dollar company by coming up with stupid ideas so who knows? Tagged Ambonnay Champagne bar, Apothic, Billecart-Salmon, Bordeaux vintages, bourbon barrel age, Bursting Bubbles, California wines, Canon-Fronsac, Cathy Corison, Ch. Chantegrive, Ch. de la Huste, Ch. Ferran, Ch. Lanessan, Ch. Le Pey, Ch. Paloumey, Ch. Vrai Canon Bouche, Chardonnay, Charles Heidsieck, Corazón, Courtney Benham, Dan Berger, David Speer, Duval-Leroy, E. & J. Gallo Winery, Frank Morgan, Fronsac, Graves, Haut-Medoc, Jameson Fink, Jérôme Prévost, Laherte Frères, Neal Martin, Pessac-Léognan, Petit Verdot, Pinot Meunier, Pinot noir, Pol Roger, Ramey, Robert Walters, Second wines, The Press Democrat, Vinous, Wine Enthusiast.